The rule of law serves to protect and promote the (human) rights of individuals irrespective of their background and circumstances. It safeguards against arbitrary decision making and repression, and it seeks to see those who enforce the law, equally conforming to it. Without discussing in detail the merits of an attempted incitement charge- which should have been brought against him had that been the situation- the least the police could have done was to arrest him on such a charge, not turn him away. This is allowed where the intended incitement does not reach the prospective incitees. Unlike the common law ground on which an arrest could have been made, the Regulation of Gatherings Act does not require gatherers to obtain a permit from the police prior to their gathering. The Act actually obligates the police to acquire credible information prior to prohibiting a gathering, and only after they have consulted the organisers of the gathering. In turning Malema away either because of the common law crime of incitement or the provisions of the Act, the police were in violation of sections 17 (the right to assemble, peacefully and unarmed) and 21 (the right to movement) of the Constitution of the Republic of South Africa, and thus disregarding the rule of law. The decay of the rule of law is the first sign that we are returning to a police state, characterised by arbitrary deprivation of the right of movement and that to assemble, but also arbitrary imprisonment, assault and possibly even executions. It is submitted that threats that Malema might incite the miners to commit crime does not suspend the application of the rule of law- for all government action must conform to the law and be sanctioned by law. The arbitrary manner in which these violations were committed brings into question a number of issues, such as the understanding by police of laws governing gatherings, the use of force by police and their preparedness in dealing with violent protests. Reminiscent of the apartheid police and government, political activists were severely restricted in their dissent, movements and areas. The rights in the Bill of Rights are not absolute and of course issues of public order and public safety are a concern in light of the fact that there was loss of human life.Section 36 sets the criteria under which rights in the Bill of Rights can be limited. Primarily, a limitation on a right in the Bill of Rights is permissible only if it is in terms of law of general application, secondly, if the limitation is reasonable and justifiable in an open and democratic society and, thirdly, the limitation must be based on human dignity, equality and freedom in light of various factors. 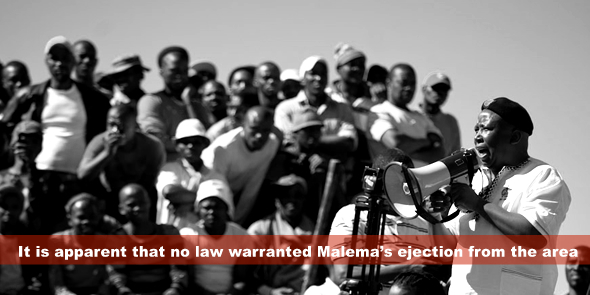 It is apparent that no law warranted Malema’s ejection from the area, neither was there a legal justification for his removal. Assuming that there was evidence that Malema was going to incite the miners to commit crime, then due process which seeks to achieve a fair proceeding and making of representation against any charge which might be levelled against an individual,would have created the necessary checks and balances that will guard against the weakening of the rule of law. As a country, we must not, in any way, tolerate the circumvention of constitutional rights, irrespective of who the victim is. “First they came for the communists, and I didn’t speak out because I wasn’t a communist. Then they came for the socialists, and I didn’t speak out because I wasn’t a socialist. Then they came for the trade unionists, and I didn’t speak out because I wasn’t a trade unionist. Then they came for me, and there was no one left to speak for me”- Martin Niemöller. Kenneth Sithebe, Student Assistant at the Institute for International and Comparative Law in Africa, University of Pretoria. The rule of law is a fundamental principle to any constitutional democratic state that I understand, and the importance there of I follow. But my thinking as regards the events in Marikana in light of Mr Malema is that, in the first place it must be remembered that in the previous meeting that he attended and spoke, other mines closed down and unrest intensified in Marikana and the surrounding areas. He clearly told the miners not to rest until their seemingly unreasonable demands are met, and they listened thus lighting the torch to other miners to do as their comrades in Marikana did. From this it is clear that this is not a man who was solution oriented and the police in their judgement, (or the commanders who issued out such an instruction) did what was at the time best to resolve the whole striking issue. I comprehend the fact that it is important to protect the mans right to address whoever he wants, wherever he wants but it is clear that in this case it was in the interest of justice that his right to do so be limited for the greater good of the community, considering what had happened before and of course the influence that the man commands. That in its self will make the limitation of his rights to movement, expression and so on justifiable in an open and democratic society. You make a rather convincing and constructive case for the rule of law. The rule of law is important to South Africa considering its past and maybe more so, its future. However, I feel that a limitation of his rights was justifiable in this case taking into consideration his nature and history (like Tshegofatso Kgomo said). This need not be so according to a piece of legislation, but maybe public policy and interest. More concerning, your analysis of the limitation clause is rather vague to conclude that any limitation was unreasonable. @Tshegofotso Kgomo, as alluded to in the post, had the police received any information, or been under the suspicion that Malema might incite the miners; they should have arrested him on an attempted incitement charge. The Constitution allows for a summary detainment of 48 hours- for further investigations or to alleviate the threat to safety. Dismissing him without reason was a dangerous thing to do- especially be people of authority ( the police). @Kgomo and Mettew, the issue of section 36 is very important and should only be invoked as a measure of last resort. Public policy does not negate the basic principles in which the constitution was founded: to protect individuals against the desires of the majority. No matter how important the collective goal might be, the violation the rights of individuals is acceptable (Dworkin) unless in very exceptional (justifiable) cases. The starting premise for a lawful limitation is: Authorised by law. Government derives it power from the law. The second premise: the law must be of general application. In casu for example, all persons who were not miners should have been turned away, this includes journalists, members of the community, government officials and so forth: WITH PRIOR NOTICE, not spontaneously. In my view, the actions of the police cannot pass the first two thresholds: thus I will not discuss section 36 further requirements.